Use these solar power kits to build your own robots or other solar energy powered applications. The series includes solar power panels, solar cars, and solar motor kits. You can build your application with the MIT Handyboard system such as Solar based Robots which can hunt the sun automatically by using servos. An ideal kit to build BEAM Robots and solar robot "fish". All solar kits are brand new and have excellent quality. Made in Japan . This Solar Power Generator Set is perfect for young children and educational purposes. Electricity generated by the solar panel is charged in a capacitor installed in the car model. Detach the car from the cradle, and you can enjoy running the car model for 3 minutes. Includes 65x65mm solar panel (Generates 2.0V 125mA / 35,000lx.). Includes car model with a car carrier. This high quality solar panel has a size of 54x18mm. The output is 1V with 60mA. A higher voltage can be achieved by putting the solar panel in series while putting the solar panel in parallel to achieve higer current. This high quality solar panel has a size of 60x60mm. The output is 3V with 75mA. A higher voltage can be achieved by putting the solar panel in series while putting the solar panel in parallel to achieve higer current. The power battery comes with mounting kits and solar array aligner mechanic which can adjust to face to the sun. The solar batteries can be used to drive the following solar motors. The power battery comes with mounting kits and solar array aligner mechanic which can adjust to face to the sun. The solar batteries can be used to drive the following solar motors: SOLAR-MOTOR-RF500 and SOLAR-MOTOR-RF270. The solar motor is manufactured by Mabuchi Motors. It comes with different size of gear heads and mounting bracket with screws. It draws very little current and is suitable to build tiny autonomous robots. It can be operated under 0.4V to 1.5V and is compatible to the solar batteries: SOLAR-BATTERY-0.5V and SOLAR-BATTERY-1.5V. The solar motor is manufactured by Mabuchi Motors. It comes with different size of gear heads and mounting bracket with screws. It is more powerful than RF500 series. It can be operated under 0.4V to 1.5V and is compatible to the solar batteries: SOLAR-BATTERY-0.5V and SOLAR-BATTERY-1.5V. The solar motor is manufactured by TECO. 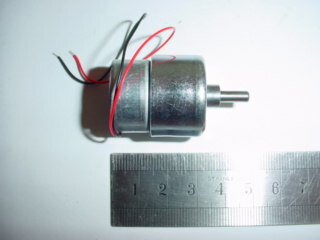 The length of the motor including the motor sharft is 38.50mm. The length of the shaft is 9mm. The sharft diameter is 2mm. 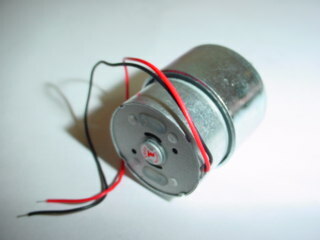 The motor body diameter is 31.70mm. It is compatible to the solar batteries: SOLAR-BATTERY-1.5V. This is a hard-to-find and brand new part. 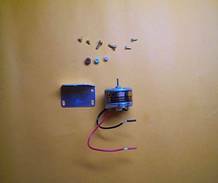 The tiny solar motor is manufactured by TECO. 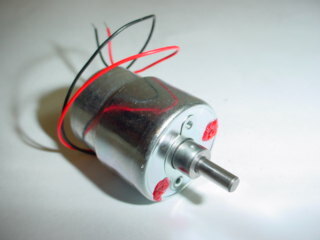 The length of the motor including the motor sharft is 16.20mm. The length of the shaft is 4mm. The sharft diameter is 0.80mm. 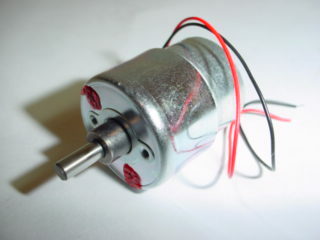 The motor body diameter is 6.00mm. It is compatible to the solar batteries: SOLAR-BATTERY-1.5V. This is a hard-to-find and brand new part. The solar motor is manufactured by Mabuchi Motors with Gearhead. It draws very little current and is suitable to build tiny autonomous robots. It can be operated 1.5V-3V and is compatible to the solar batteries SOLAR-BATTERY-1.5V. The tiny solar car comes with solar battery with a small solar motor (rightmost upper corner). 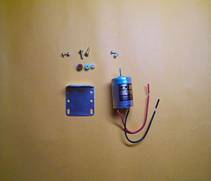 The solar panel provides 0.5V with 300mA to the small solar motor. You can use SOLAR-BATTERY-0.5V (sold separately) to achieve a better result.The kits comes with all necessary parts to build a tiny solar powered racing car. Assembly instructions included. The solar racing car comes with solar battery SOLAR-BATTERY-0.5V with solar motor SOLAR-MOTOR-RF270 . It comes with 26mm diameter front wheel with steerable front axle, and 55mm diameter rear wheel. There are three gear ratios (1.7:1, 2.2:1, 3.4:1). A great platform to be modified as a solar robot platform. Assembly instructions included. Using the Solar Car Assembly is a great way to experiment with gear ratios and the angle and intensity of solar light. With three gear ratios, high speed (1.7:1), mid speed (2.2:1), and low speed (3.4:1), you can see the difference gear ratios make under different conditions. The ball-mounted solar panel allows you to angle the panel towards or away from the sun, showing how direct and indirect solar light can affect power. Experiment under a variety of conditions (sunny, cloudy, etc.) and different gear ratios. Once a popular Japanese cartoon character, Doraemon is an exciting subject for a solar vehicle. The adjustable solar panel allows you to angle it to receive more direct solar rays for optimal power and speed. The front wheels can be adjusted to steer the car left or right. Solar Motor 01 is included. The kit also includes the driver figure, Nobita, and a helicopter propeller that can be mounted on top of the vehicle. No painting is necessary, and only the eyes and whiskers stickers need to be applied. Check for our hardware gadgets, geraboxes, and other parts to build your robots!